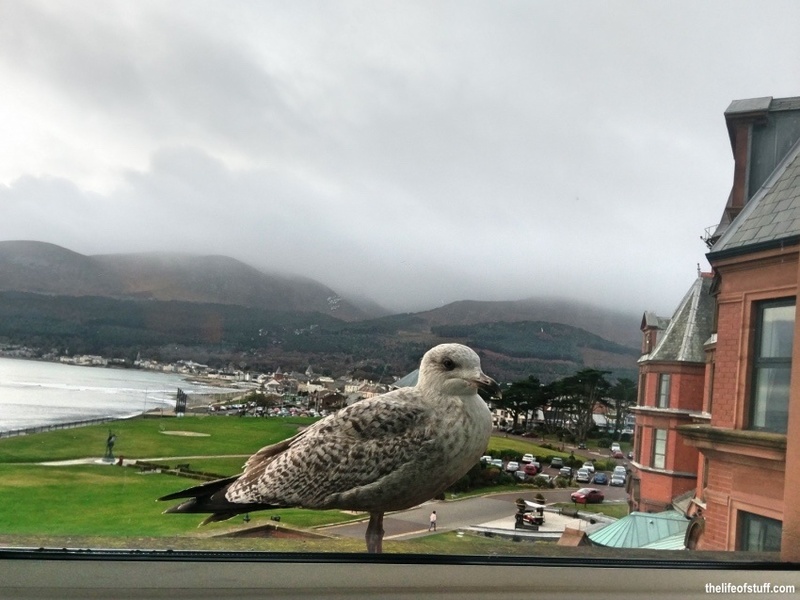 When the opportunity arose for Patrick, Smith and I to avail of bed and breakfast for two nights at the four star luxury Slieve Donard Resort & Spa, I, or should I say we, welcomed it with open arms. 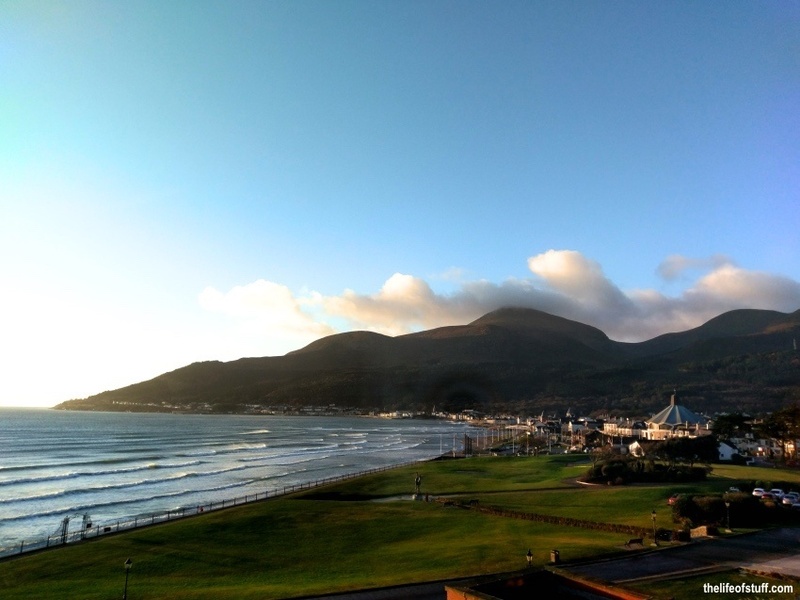 Not only had we read about the Slieve Donard through its website, and searched photographs online, but as Patrick’s parents had stayed there before, we had also heard great things about the hotel in person, or ‘from the horses mouth’ as they say. 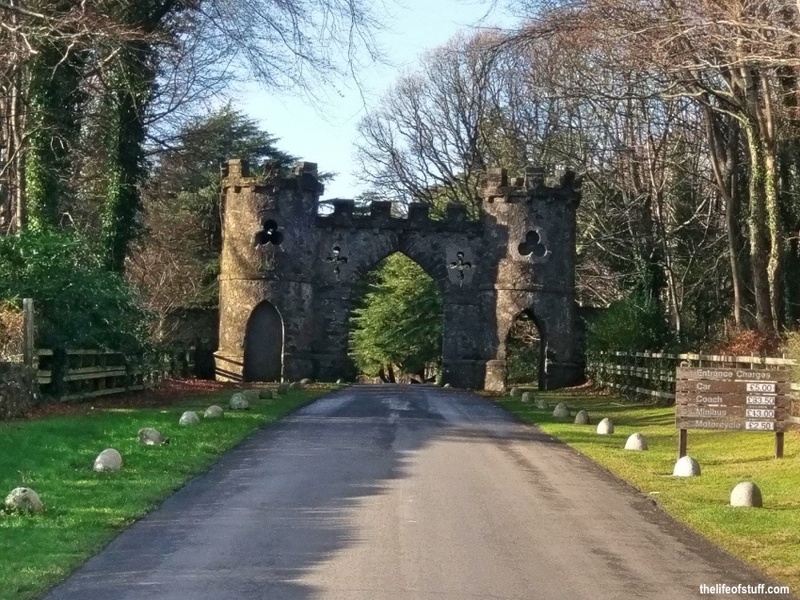 We arrived at the hotel and resort a little later than we had planned but as we love our road trips, and have a very big soft spot for Northern Ireland, the trip was a pleasant one. It was also really lovely to arrive at the hotel when all the lights were lit, giving the place a welcoming glow before we even set foot inside. 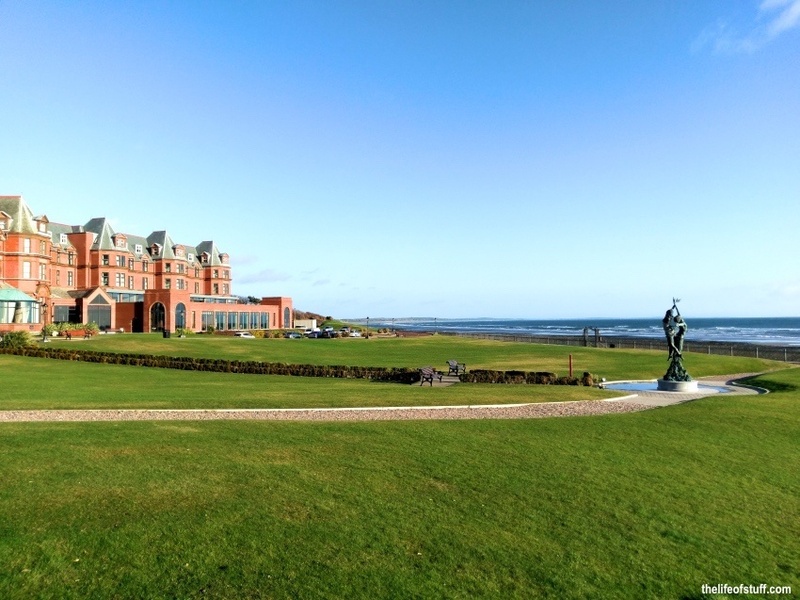 If travelling from Dublin, the Slieve Donard Resort and Spa is less than two hours away by car. If travelling from Belfast it’s less than an hours drive. The fire was lit at reception and the plaques on the wall telling us that greats such as Charlie Chaplin and Percy French had slept under the very roof we were about to sleep under, really set the scene for a wonderful stay ahead. Check-in was easy and we booked our table for dinner at the Oak Restaurant there and then. Our room was a fine size, with ample room for the addition of Smith’s cot. The comfortable sitting area provided enough space for us to actually create his own little room when sleeping at night. 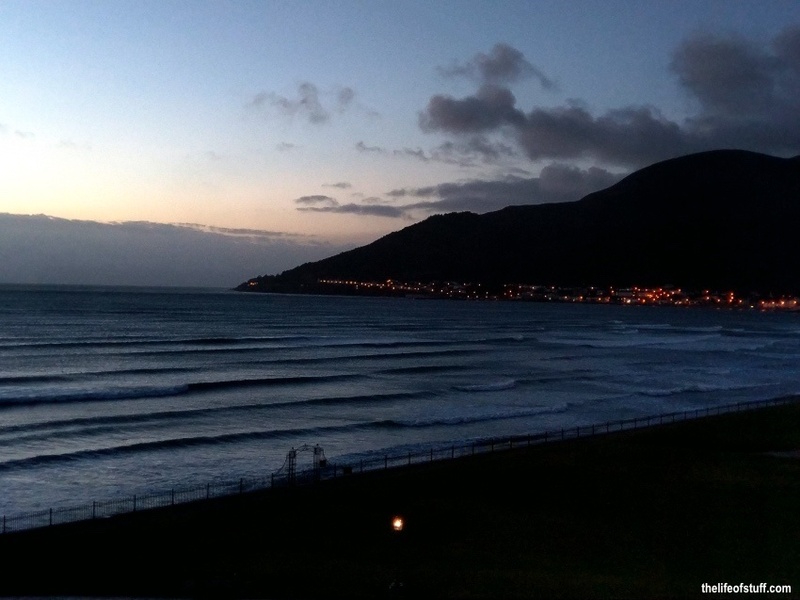 The large windows looked out onto the beach, the Irish Sea and the Mourne Mountains, a gorgeous sight every stage of the day and night. Our bed which was large, really comfortable and dressed in quality linens, was self explanatory to the ‘Cloud Bed’ name given by Slieve Donard. 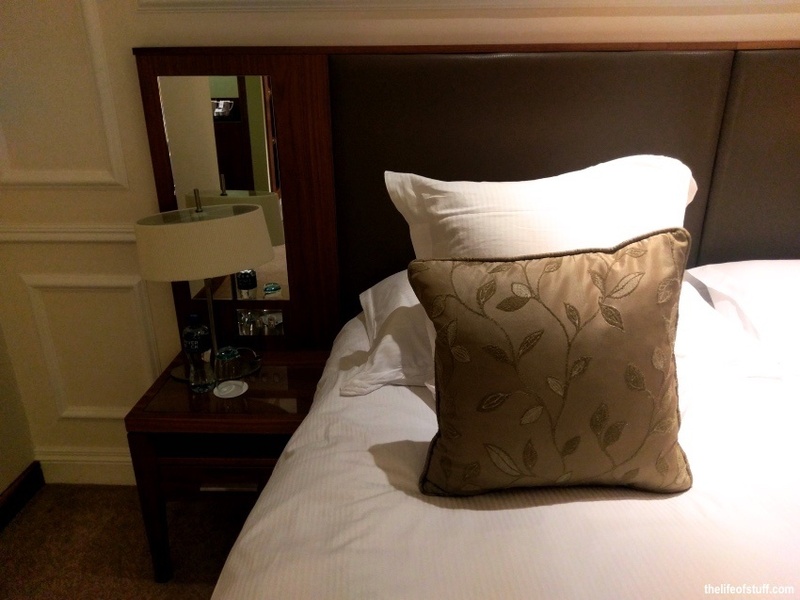 If only all beds could feel like clouds to sleep on I’d be on ‘Cloud Nine’ (apologies I couldn’t help it). 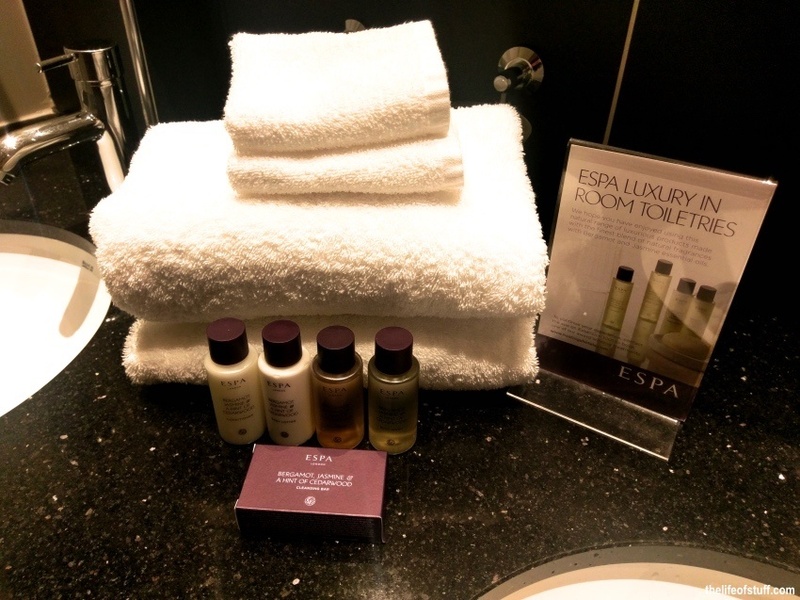 The facilities in our room ranged from luxury Espa Toiletries to fluffy robes and slippers. Tea and Coffee making facilities were available in room, and Patrick and I were secretly delighted with the movie channel options on T.V., as it allowed us some chill out time together as Smith slept. 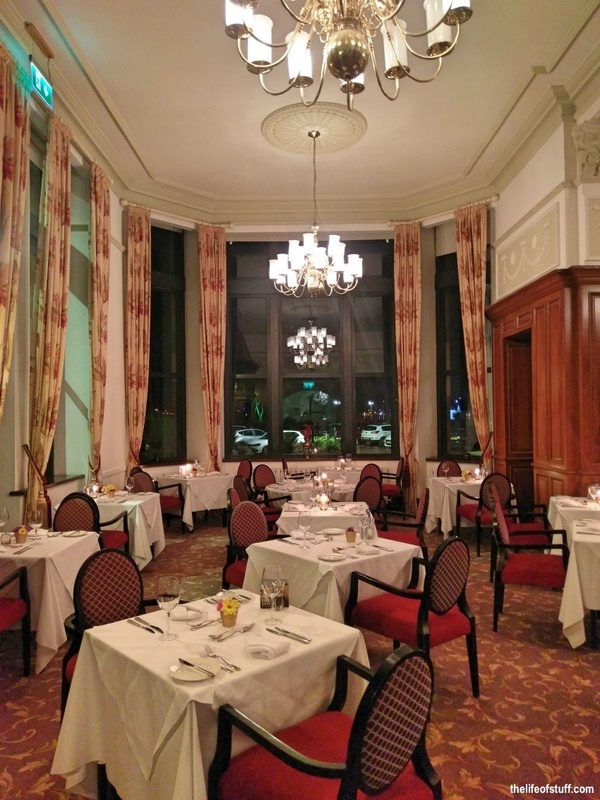 On our first nights stay we dined at the Oak Restaurant in the hotel. Our booking was made for 6.30pm, the first sitting of the evening. We arrived at the restaurant at 6.20pm as we wanted to choose our table and get Smith settled. Upon arrival we were asked by the Restaurant Manager to return at 6.30pm, and advised that we could sit in the bar area. This wasn’t a problem of course, as you can see from my photograph above the bar/lounge area is very inviting, and if it had just been Patrick and I alone, I probably would have welcomed an aperitif before dinner. However I do feel that the strictness of this timing considering we had a toddler in arms who wanted nothing more than show us how fast he could run, was unnecessary and exceptions should be made through observation. The Oak Restaurant is to the left of the lobby and reception area. It’s a grand room, with beautifully high ceilings, wooden clad arches, an open fire and extra-large windows that look out onto the sea and mountains beyond. We were seated by one of the windows and a high chair was provided for Smith. We chose our dinners from the Á la Carte Menu, but as we had dined on a late lunch decided to keep it to one course as opposed to our usual three, four and often five courses when dining out. 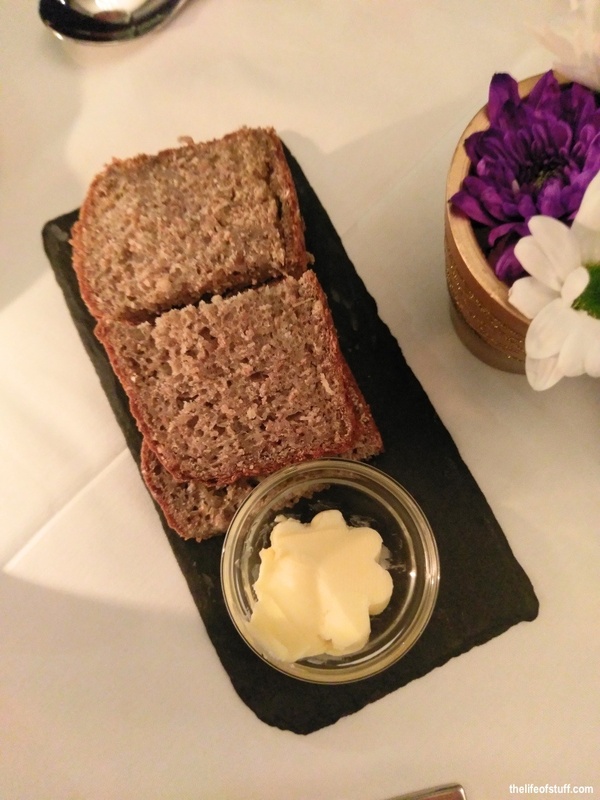 Deliciously fresh bread was served and we all enjoyed it before our dining choices arrived. 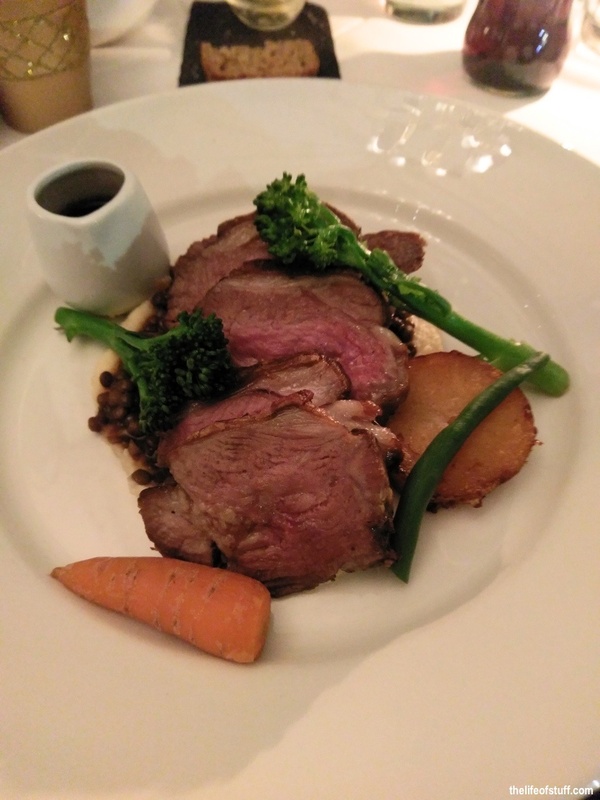 Patrick’s main course of ‘Seared Rump of Mourne Lamb served with Creamed Celeriac and Puy Lentils’ (£25) was quite a fitting choice as he had a view of the Mourne Mountains as we dined that evening. He thoroughly enjoyed it and found the serving size satisfying. I opted for two starters instead of a main dish because I was concerned that I wouldn’t appreciate a main course, hunger-wise. I was delighted with my choices. 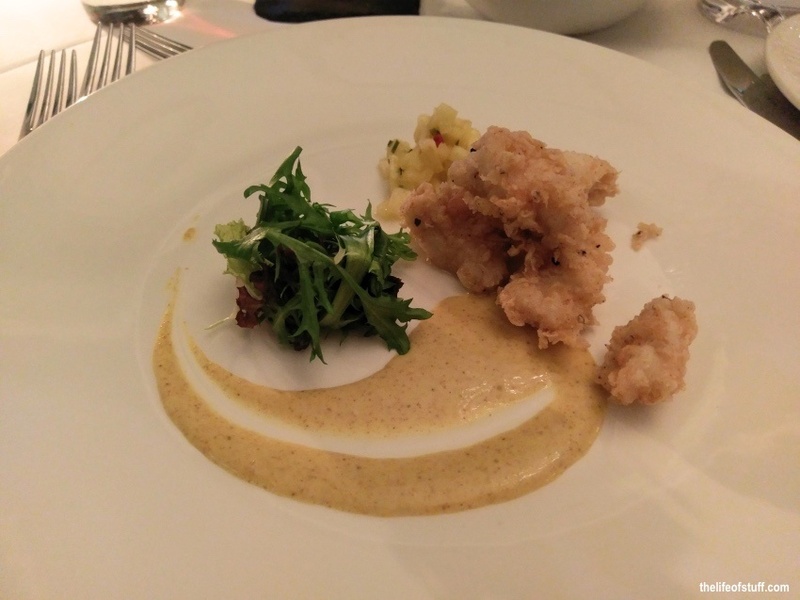 I chose ‘Crispy Monkfish Cheeks served with Pineapple Salsa & Curried Coconut’ (£8). Delicious and recommended. 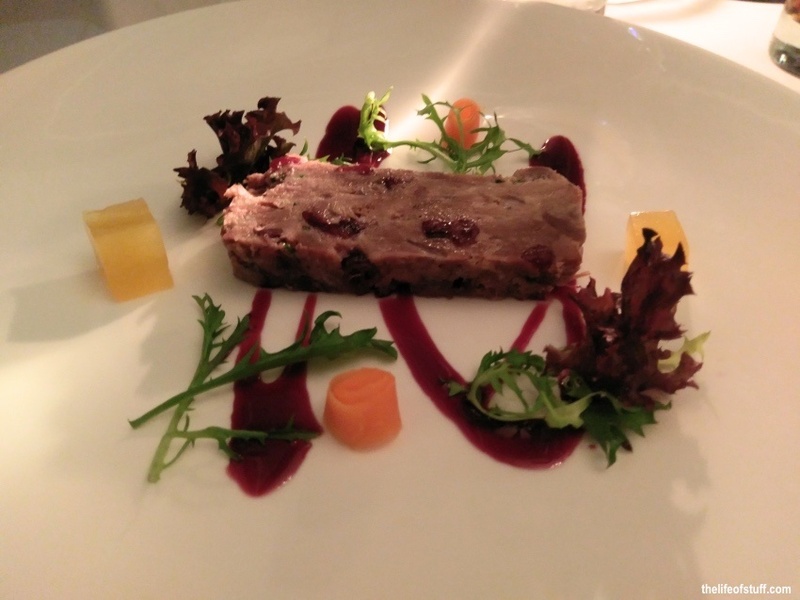 I also chose ‘Pressed Confit of Duck accompanied by Sundried Cranberry Terrine, Spiced Orange Jelly & a Mulled Wine Syrup’ (£10). Again delicious, richer in taste, which goes without saying, but packed full of great flavours. Our compliments to Head Chef Hazel Magill and to the waiting staff who served us, making our dining experience pleasurable and satisfying. The next morning the view from our window as the sun began to rise was beautiful. 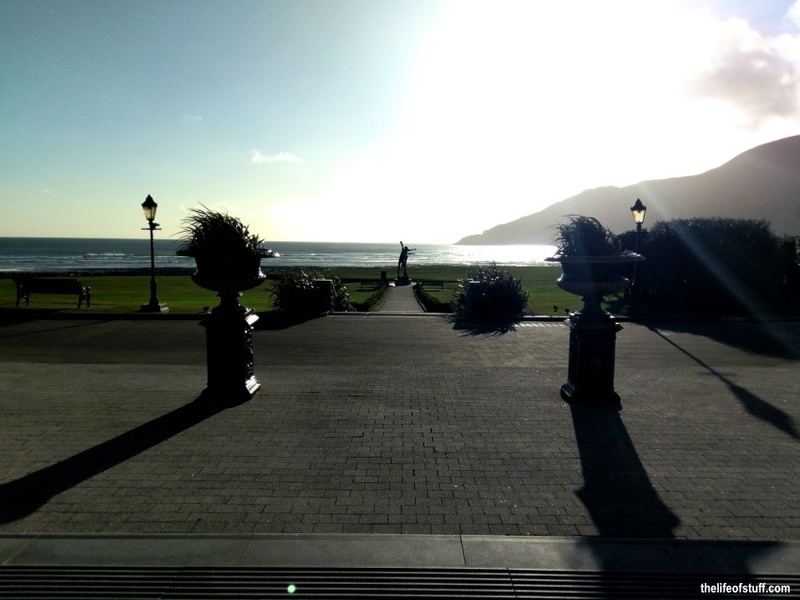 Slieve Donard Resort & Spa couldn’t be better placed for its scenery. 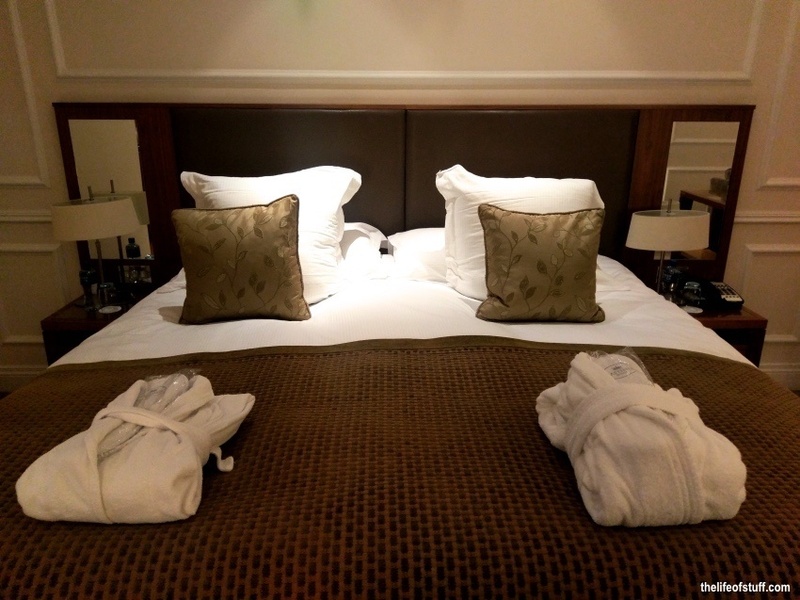 Memorable for a family breakaway or a romantic getaway. 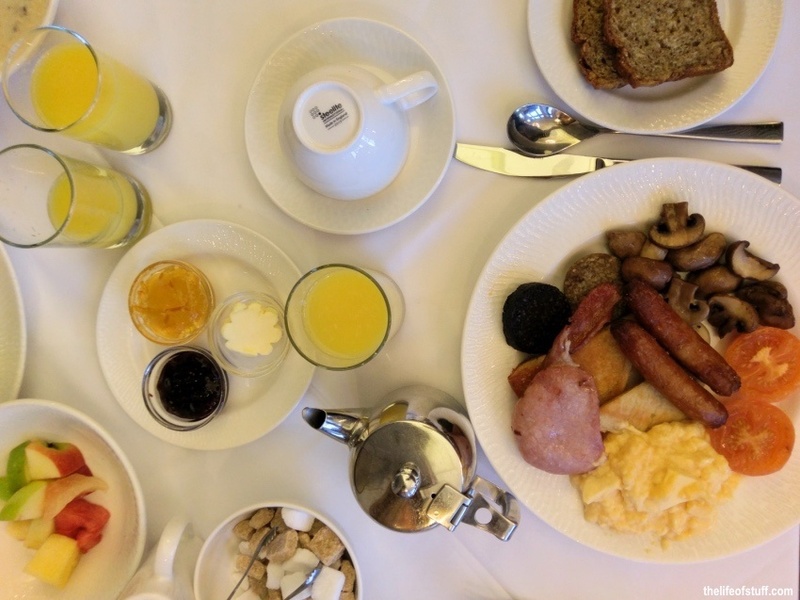 We enjoyed a fulfilling breakfast with lots of healthy and hearty options before returning to our room to prepare for the morning and day ahead. Oh and what a day greeted us! Beautiful blue skies and sunshine. You would never have guessed it was January and still winter! We were even greeted by a local who was more than happy to strut his stuff and shake his tail feathers at us. Smith even got close up and personal with our feathered friend before we left for the pool. No fear, just inquisitiveness on both sides of the glass pane. 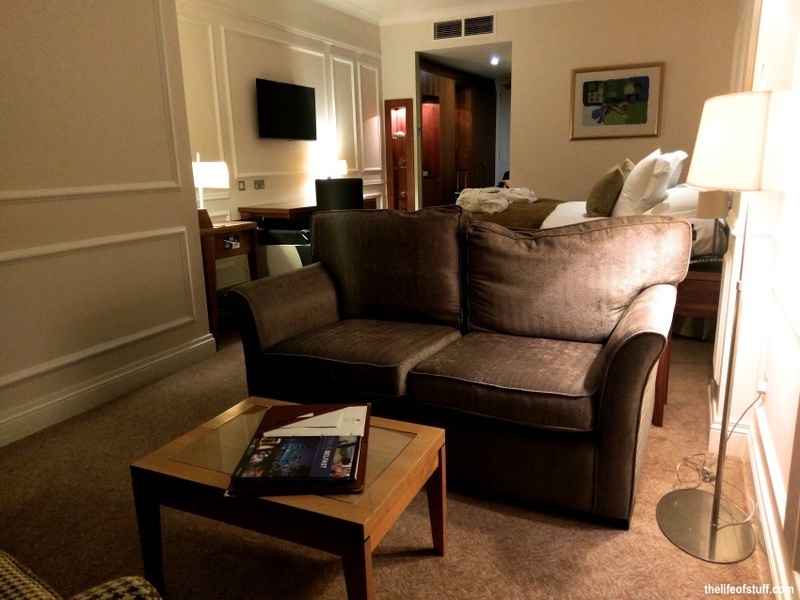 The spa at Slieve Donard is everything you’d want from a luxury hotel whether your stay is with pampering in mind, or whether like us you have a toddler to entertain (there are specific times for children to use the pool). Spread across two floors, the spa includes a gym, pool, rock sauna, amethyst steam room, and drench showers, not to mention treatment rooms that offer everything from hot stone therapies to manicures. On our next visit, because we do plan to return, I’ll be booking myself in for a treatment or two, definitely. On this visit, our main focus was the pool area and we all enjoyed it whole heartedly. The view as the sun shone through the windows across the pool and into the juice bar was magical. The pool itself is a great size, allowing for proper ‘lengths’ when swimming, and space enough between guests when relaxing. The jacuzzi was positioned at the floor to ceiling windows, and was extra-large in size – allowing for a relaxed experience for a number of guests without imposing on personal space. 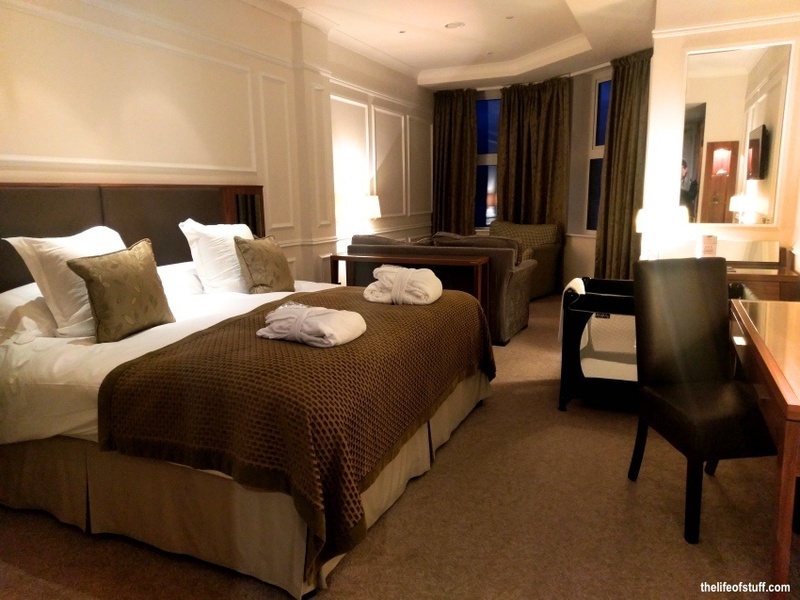 The Slieve Donard Resort & Spa is a gorgeous looking hotel throughout. From its reception area to its beautifully ceilinged corridors, from the Oak Restaurant to the Lighthouse Lounge (we dined here the second evening of our stay and I can highly recommend the ‘Smoked Salmon Royale, Walter Ewing’s Smoked Salmon resting on Potato Bread topped with a Poached Egg and Hollandaise Sauce’ (£12). From the spa inside to the stunning scenery just outside its doors. From its red bricks to the blueness of the sky and sea that envelopes it. 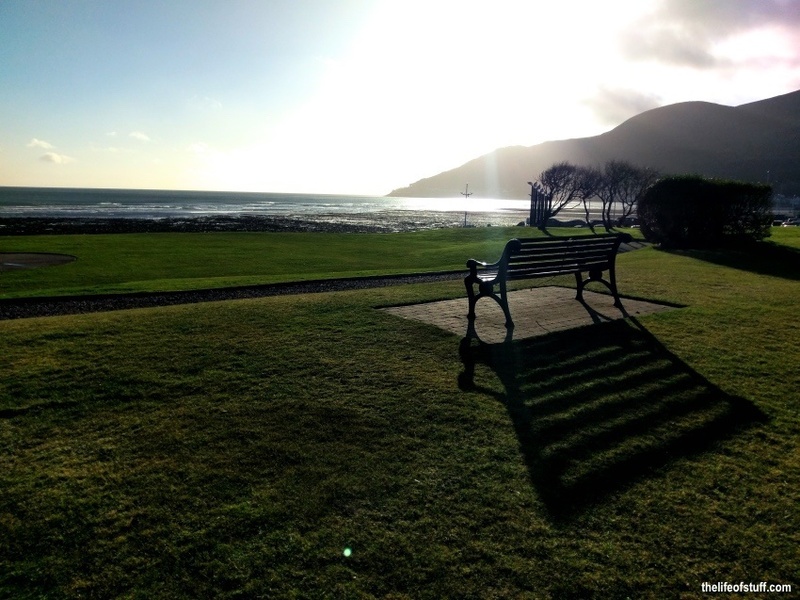 From the greenness of the grass that surrounds it and the mountains who nod to it every morning and night, Slieve Donard Resort & Spa really is a special place. 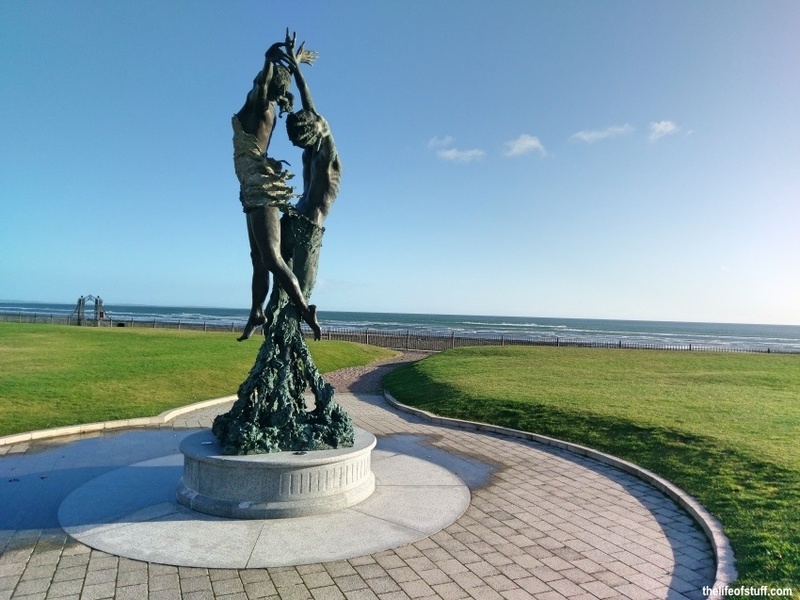 I loved the hotels support for the arts, pictured is the ‘Moon & Sea’ by Sculptor Paddy Campbell. 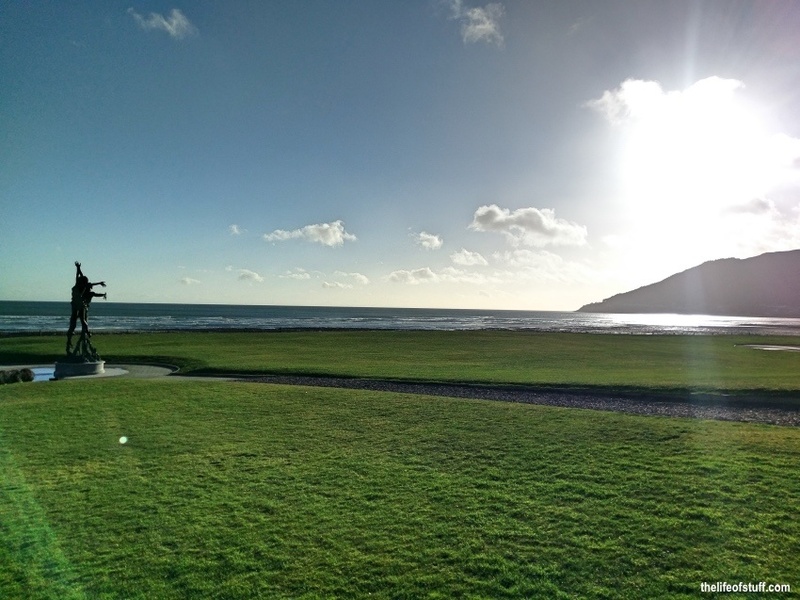 I appreciated the hotels appreciation of nature, with its unrivaled and unobstructed views from its front garden (golf lovers will no doubt be familiar with the world-famous Royal County Down golf course), and the places of interest it suggests to visitors. Places that are nature driven, from mountain treks to forest walks, from seaweed soaks to sea safari’s. 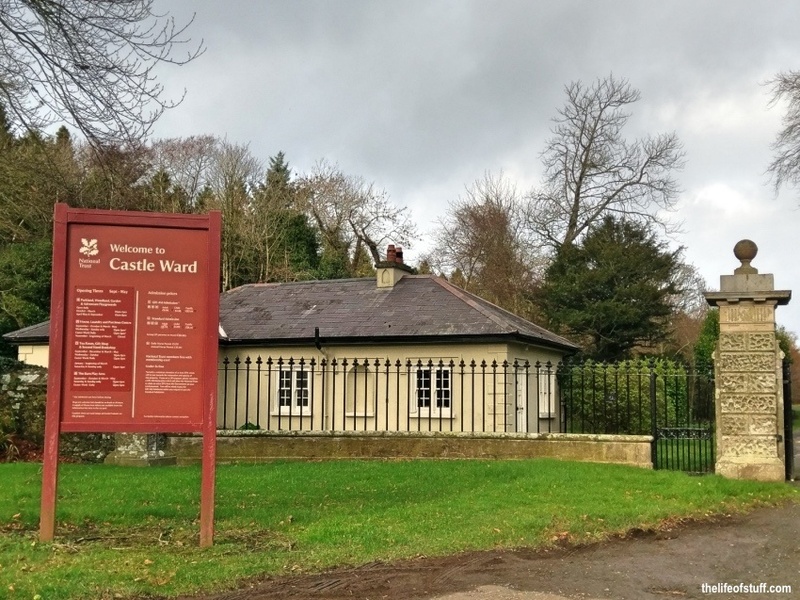 We actually took a leaf out of the attraction recommendations and visited both Tollymore Forrest Park and Castle Ward – both beautifully worthwhile visits with exciting links to the Game of Thrones (we’re fans). 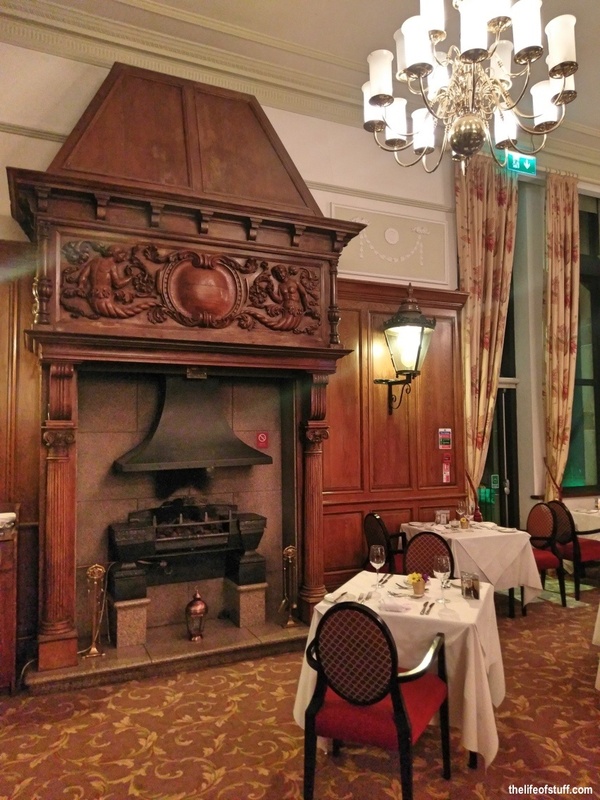 And on that note, it’s worth noting the Percy French Restaurant at Slieve Donard not only serves a “Westeros Tomahawk” steak (we’ll be returning to try it out!) 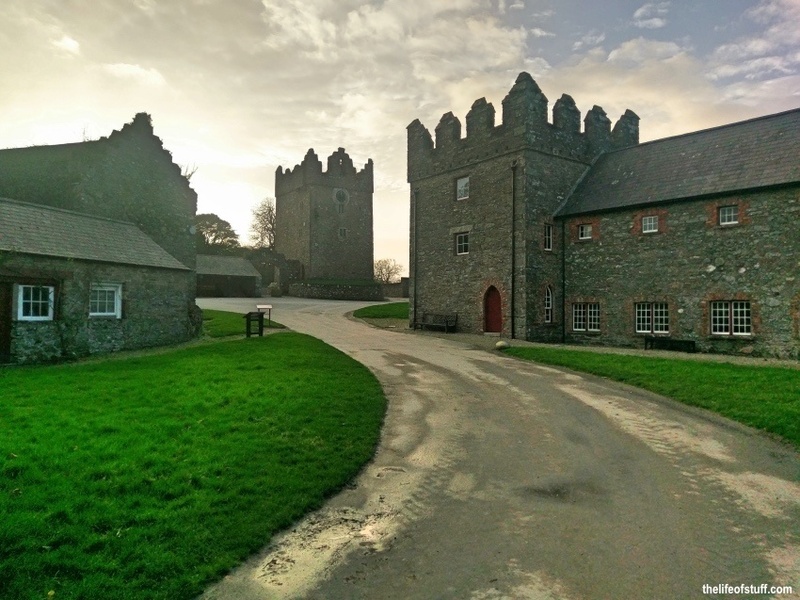 but is also home to one of the specially designed Game of Thrones Doors commissioned by Tourism Northern Ireland and Tourism Ireland’s for their 2016 Game of Thrones campaign. As mentioned a return is definitely on the cards. 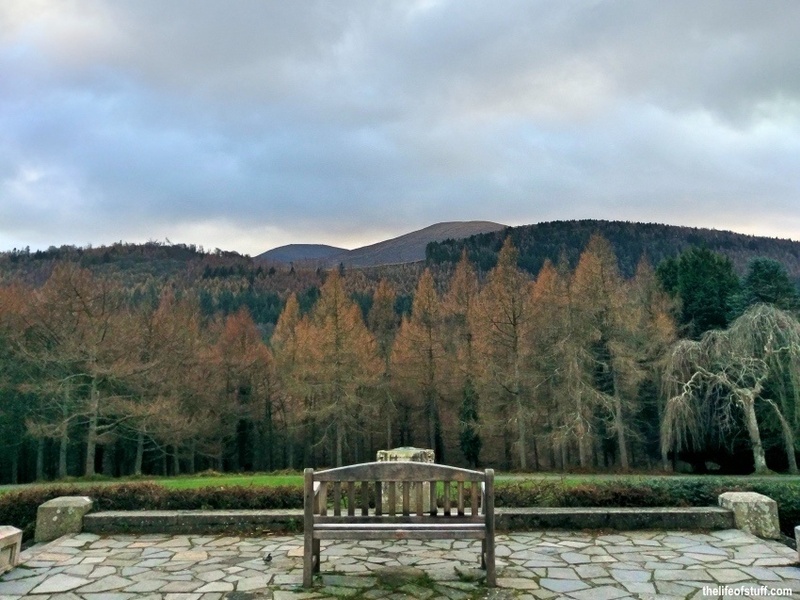 There is so much more for us to experience both inside Slieve Donard Resort & Spa, and outside of it, in its seaside town of Newcastle and the mountains and forests beyond. 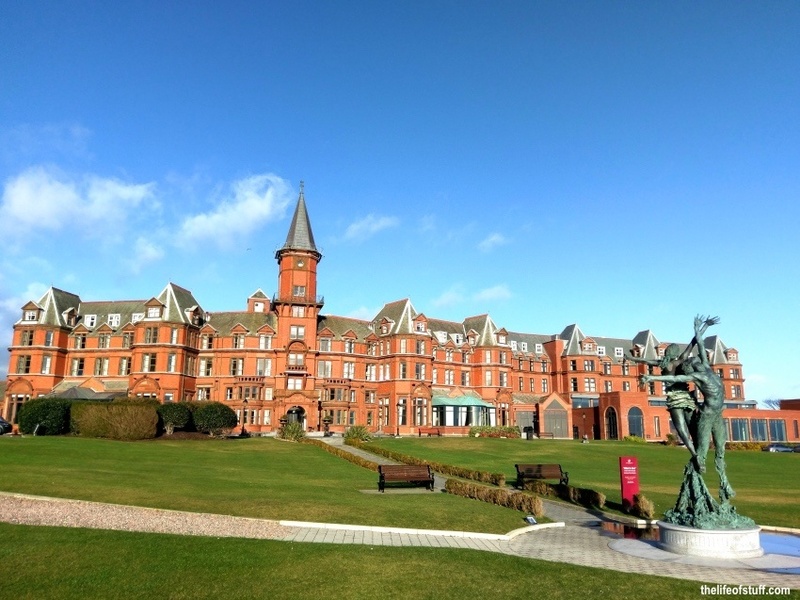 For more information or to book visit the Slieve Donard Resort & Spa Website – when there I highly recommend you sign up for their newsletter for special offers and news. You’ll also find them on Facebook | Twitter so you can connect there too. "REAL BODIES only in Dublin” at the Ambassador Theatre plus Win Tickets to the Opening Here!